Doctor A: There it is, the planet most similar to ours in all the universe, the Earth. Its atmosphere contains 21% oxygen and 78% nitrogen, Among its other properties are argon and carbon dioxide. I picked up this movie not too long ago with decent expectations. All I can say is that 60s Gamera was not 60s Godzilla. This movie came out the same year as "Destroy All monsters", and anybody who knows kaiju knows that's not even a debate. To say this film lacks the character, charm, art, graceful music and over all atmosphere of Honda's work is an understatement. Now, this film had many a problem that even for a giant monster fan were just hard to sit through. The camp is pretty horrendous, and the human characters are completely dismal. Same old annoying kids, in a world where youngsters are held hostage by aliens who then let them wander their ship which has a machine that can produce ANYTHING they desire. As far as idiotic plots, they could almost take the cake with this one. All along accompanied by a score I just do not care for. oh and did I mention that if you haven't seen "Gamera vs. Barugon" or "Gamera vs. Gyaos" you get to see like almost ten minute-each flashbacks of each of those films? These flashbacks go on for quite a bit of time, I suppose to give the appearance that this is a feature run-time flick. When I first saw it, I was surprised. About more than half of this movie's action sequences are stock-footage. For Godzilla's sake, don't use stock footage from a black-and-white movie in the full-on color one; someone's bound to notice you know? However, after 90% of the film being completely pointless and redundant, there is pretty entertaining fight at the end. Too bad it was too little too late. Viras is a squid-like alien kaiju, who I suppose to some extent would provide inspiration for Irys in the 1999 film "Gamera 3: Awakening of Irys", but it's a much simpler concept design. 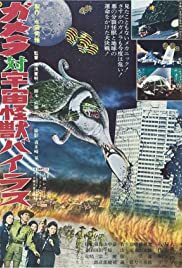 I tracked this film down pretty much for the adventure of watching all the Gamera movies, but by no means is this one of the best, not by far. "Gamera vs. Barugon" and "Gamera vs. Gyaos" are far better made, hell even "Gamera vs. Guiron" improves on this one. Watch if you dare!